This sweet little kitten was found last week along Reichs Ford Rd by a good samaritan and brought in for an examination. After determining the baby kitten was negative for FIV and feline leukemia it was treated for ear mites and an upper respiratory infection. The very kind good samaritan reports the 4 week old kitten is doing very well. Yipee! Note: Be aware if you are picking up a stray or hurt animal it may be frightened and could bite or scratch. Often these animals are not vaccinated for rabies so use caution!! This entry was posted in Uncategorized on July 30, 2009 by yourfriends. On July 25th the Westview Regal Cinema held a family fun day for the premier of GForce, the new kid friendly guinea pig spy movie. The festivities included a moon bounce, face painting and games and prizes for the kids. There were also representatives from the animal community at the event. 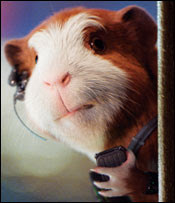 Their purpose was mainly to dispell the characteristics propogated by film of the wild and fun loving nature of guinea pigs. Kingsbrook Animal Hospital and Small Angels Rescue were both there with information and sample products to help give people some sense of what it means to properly feed and care for a guinea pig and that their nature is usually very timid and it takes a lot of time and reassurance to gain their trust. Small Angels rescue has a variety of small pets available for adoption that include guinea pigs, hamsters, gerbils, rats and mice. If you are in the market for a small pet it is always better to find out if a rescue group has an appropriate animal for you. Other groups reprensented at the event were Frederick County Humane Society and Loving Pet Nannies. Watch out for future movie premier events and Regal Cinema. 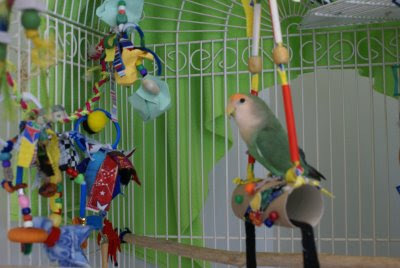 These bird toys are great because they have hidden treats, different textures and have moveable parts. Birds need more mental stimulation when in captivity. They need the challenge of foraging for food, chewing and playing. It is also important to rotate toys to help prevent boredom that could bring on behavioral issues. Make their environment fun and you will have one happy bird! For more information about purchasing these toys, contact Sabrina at 301-831-6341. This entry was posted in Uncategorized on July 27, 2009 by yourfriends. Held in conjunction with the “Animals in Art” exhibition on view in the Washington County Museum of Fine Arts Kerstein Gallery the museum will present the Animal Artists Family Festival on Sunday, July 26 from 2:00 to 4:00 p.m. This event will feature Maryland’s Dog Whisperer, Susie Homire, in the lecture, “Becoming the Leader of Your Pack”. Caricaturist Kent Roberts will also be on hand to draw visitors or a fun animal caricature – please bring a photo of your pet. 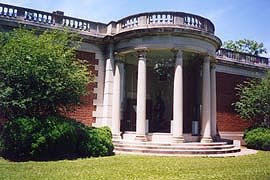 For more information, please call 301-739-5727 or visit www.wcmfa.org. This entry was posted in Uncategorized on July 24, 2009 by yourfriends. French poodles did not originate in France. 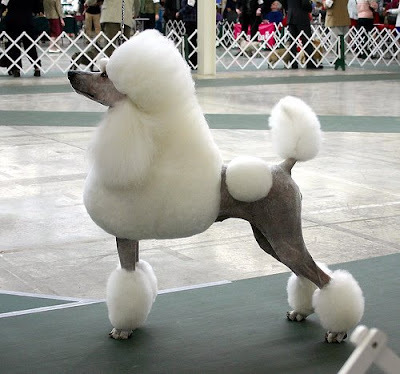 Poodles were originally used as hunting dogs in Europe. The dogs’ thick coats were a hindrance in water and thick brush, so hunters sheared the hindquarters, with cuffs left around the ankles and hips to protect against rheumatism. Each hunter marked his dogs’ heads with a ribbon of his own color, allowing groups of hunters to tell their dogs apart. Inbreeding causes 3 out of every 10 Dalmatian dogs to suffer from hearing disability. It has been established that people who own pets live longer, have less stress, and have fewer heart attacks. Korea’s poshintang – dog meat soup – is a popular item on summertime menus, despite outcry from other nations. The soup is believed to cure summer heat ailments, improve male virility, and improve women’s complexions. Lassie was played by several male dogs, despite the female name, because male collies were thought to look better on camera. The main “actor” was named Pal. Lassie, the TV collie, first appeared in a 1930s short novel titled Lassie Come-Home written by Eric Mowbray Knight. The dog in the novel was based on Knight’s real life collie, Toots. Marie Antoinette’s dog was a spaniel named Thisbe. Most pet owners (94 percent) say their pet makes them smile more than once a day. Pekingese dogs were sacred to the emperors of China for more than 2,000 years. They are one of the oldest breeds of dogs in the world. Prairie dogs are not dogs. A prairie dog is a kind of rodent. President Franklin D. Roosevelt’s most famous canine companion was his Scottish Terrier, Fala, who is part of the Roosevelt Memorial in Washington, D.C. But during Roosevelt’s 12 years and one month as president, 11 dogs lived in the White House. They included a Bullmastiff, two red setters, a retriever, a Bulldog, a Llewellin Setter, a Scotch Terrier, a Great Dane, a Sheepdog, and a German Shepherd who tried to rip the pants off the British Prime Minister. This entry was posted in More Dog Facts on July 21, 2009 by yourfriends. Have you heard about the NEW vaccine that aids in the prevention of Canine Periodontal Disease? Pfizer has created a new vaccine called the Porphyromonas vaccine which helps to reduce the 3 main types of anaerobic bacteria that cause Periodontal Disease. Periodontal Disease is the most common disease among dogs – it affects more than 8 out of 10 dogs by 3 years of age! Periodontal Disease is caused by bacteria that live in the absence of oxygen (anaerobic bacteria). These bacteria cause inflammation and infection of the gums and bone surrounding your pets teeth. It is important to note that this vaccine was designed to be used as part of a complete dental care program for your dog – it does not replace your current dental home care or professional cleanings. To Find out more about this exciting new product please feel free to contact us at (301)631-6900. This entry was posted in Dental Vaccine on July 18, 2009 by yourfriends. Warm weather is here, and that means you and your dog will likely be spending more time outside. We’ve compiled 10 ideas to help you and your pooch get in on some safe summer fun. 1. Splash around. Buy a plastic kiddie pool for your dog to cool off in, or let him practice his doggy paddle at a pool or the beach. 2. Beach blanket bingo. Hang out at a dog-friendly beach or bring your dog along for a waterside picnic. 3. Disc-o time. 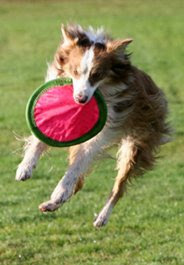 Test your dog’s skills at Frisbee. 4. Squeaky clean. Schedule a bath time play-date with your friends’ dogs and have an outdoor dog wash.
5. Take a hike. Bring your dog hiking on a nearby wooded trail. Make sure your pet is protected against fleas and ticks. 6. Campy fun. Take your dog camping at pet-friendly campgrounds. 7. Park life. Visit your local dog park for some doggy socializing. 8. Walk it off. Take your dog for a walk in your neighborhood. 9. Summer school. Choose a dog trainer so your dog can brush up on his etiquette. 10. Go for a ride. Safely secure your dog in your car, and take him with you for a ride. Remember to outfit your dog with a collar and ID tag that includes your name, address and telephone number. No matter how careful you are, there’s a chance your companion may become lost—an ID tag greatly increases the chance that your pet will be returned home safely. And even a dog with a valid license, rabies tag and ID tag should not be allowed to roam outside of your home or fenced yard. It’s best for you, your community and your dog to keep your pet under control at all times. Also be sure that your dog has access to clean, cold water at all times—dogs can overheat quickly! Now get out there, and enjoy the season! This entry was posted in Uncategorized on July 15, 2009 by yourfriends. Soon, pet owners who live in a handful of large U.S. cities will have the ability to do that. 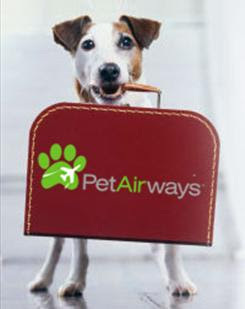 Pet Airways plans to begin service on July 14 as the USA’s first pets-only carrier — no human passengers allowed. The introductory fare: $149 each way. For that, pets will be flown in individual crates in lighted and pressurized plane cabins, with a human attendant checking them every 15 minutes. They’ll board, just like people, from their own airport lounges and get overnight lodging accommodations on long-haul flights. Their owners can track their whereabouts at all times online. They can even earn “pet points” as frequent fliers. Pet Airways won’t solve every owner’s needs initially. It will serve only five U.S. destinations: Baltimore/Washington International Airport, plus non-commercial airports in the New York City area, and in Chicago, Denver and Los Angeles. It’s catering to dogs and cats starting out. And it’ll fly each route once a week. The key to Pet Airways’ success may be its choice of aircraft: the affordable, economical Beech 1900. The 1900 won’t fly as fast or as far as a jet. But unlike time-conscious humans, dogs and cats shouldn’t mind. Making more frequent stops for fuel actually is a good thing for animals. It’ll give attendants time to get the animals out of the plane for a walk and potty break. This entry was posted in airlines on July 12, 2009 by yourfriends. There’s no place like home, but if you can’t leave your pet at home when you are away, here are some suggestions for choosing the right kennel. Ask Questions – ask friends, trainers, veterinarians, animal shelters and pet groomers if they have suggestions. Make unannounced visits – go by various boarding facilities and ask for a tour. If the staff is not willing to give you a tour, look elsewhere. Check out the staff – are they caring, professional, and knowlegable? Are they friendly and open to your questions? Visually inspect the facility – is it clean, well stocked, and orderly? Do they have plenty of room for the pets to exercise? Is there plenty of water available for the pets? Are there any potentialy dangerous objects within reach of the pets? 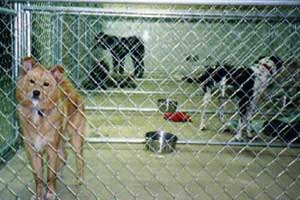 Are the animals, especially older and smaller ones, provided extra blankets or beds? Do all the animals have blankets or beds so they do not have to sleep on the floor? Is medical care provided or readily available in the event of an emergency? What procedures are taken? What can you do to make the choice easier? Board your pet for a few hours or overnight before going away to get an idea of how he or she responds to the environment. Consider a pet sitter if your pet does not respond well to being boarded. Give all necessary information to the staff regarding your pet’s food, medications, and habits. Make sure the staff is aware of any illness and is familiar with the proper treatment procedures for you pet. Leave a favorite toy or article of clothing with your pet if the kennel will allow. Give the facility the phone number of a local third party and your veterinarian, as well as phone numbers where you can be reached in an emergency. Call the facility while you’re away to check on your pet. This can be a stressful time for you and your pet – being prepared will help make it easier on both of you. This entry was posted in Uncategorized on July 9, 2009 by yourfriends. Below is a bit more information about the studies and information about arranging a time to participate. The purpose is generally to learn more about how dogs think about the world. Participation usually takes about 1 hour total. They only use positive reward in our studies (treats and praise). Although they have 2-calorie treats, IAMs dog food, and water for use in the lab, they can also accommodate special food requests for most brands or you can bring in your dogs’ favorite treats. Here’s a little information about some of the tasks that they use (You can also visit http://sites.google.com/site/hooddogstudy/ to learn more.). However, the exact tasks that you and your dog(s) participate in might vary depending on when you come in. 1. How long can your dog wait for a treat? They would ask you to place a piece of food on a dish and ask your dog not to take it. They measure how long it takes before your dog takes the treat. 2. What does your dog understand about others’ interactions? Your dog would watch a demonstrator interact with 2 actors displaying different traits (e.g., generous vs. selfish or stern vs. lenient). After watching the demonstration, your dog would be given a choice of which demonstrator he/she would like to take a treat from. They repeat this several times to see how your dog’s choices vary over time. 3. Does your dog understand causal events? They would show your dog a series of events with toy race cars on a track. They would record how long he/she looked at each event on the track. 4. How do your choices as an owner affect your dog’s choices? Most dogs prefer larger quantities of food. That is, if given a choice between 8 pieces of food and 1 piece of food, dogs choose the 8 pieces. However, what if you, his/her owner, display a dislike for that larger quantity? Would your dog then prefer the smaller quantity? 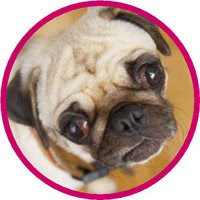 In this task, They vary how you act towards food and observe your dog’s reactions over a number of trials. – Dogs must not be aggressive with new people or around food. – Dogs must be over 6 months of age and in good health. This entry was posted in Uncategorized on July 7, 2009 by yourfriends.